Vocabulary is a strong indicator of reading success (National Literacy Trust, 2017). We know from research that the size of a child’s vocabulary is the best predictor of success on future tests. Children with a poor vocabulary at five are four times more likely to struggle with reading in adulthood (Why Closing the Word Gap Matters: Oxford Language Report, 2018). At Oakthorpe, we also know that a good understanding of a wide range of vocabulary supports success across the whole national curriculum. Therefore pupils are regularly taught new vocabulary in all areas of the curriculum. Through indirect instruction; using rich reading experiences to grow vocabulary ‘naturally.’ Paying attention to context to work out meaning and using background knowledge. Vocabulary learning is taught in a fun and active way across the curriculum and innovative ideas such as the use of digital technology used. Teachers carefully select vocabulary they want to directly teach. Teachers plan direct instruction for tier two words, as they can have a powerful impact on verbal functioning and be applied to a range of different situations (Beck et al, 2013). 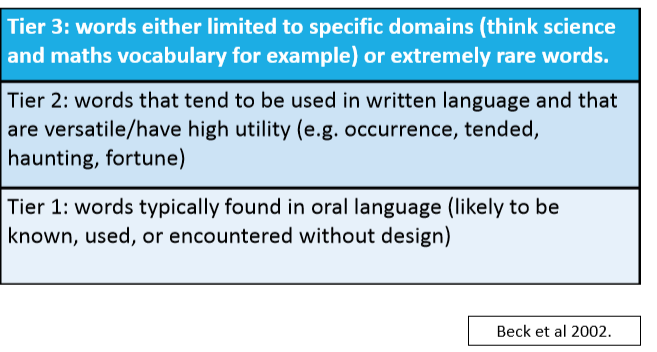 Below shows the prior background knowledge and tier 2 vocabulary children would have needed to know in order to access the questions in the 2018 KS2 Reading SATS paper.